What's great about these videos is more of the mentality of Elkington once he figures out the strategy he wants to employ. Immediately, that tells me that I don't want to go anywhere else. That's out (points to the water on the left) and that's out (points to the waste area to the right). I'm just going to beeline at the green bush up there to play the hole. Elkington acknowledges the trouble, but has focused solely on the target. And as Dr. Bhrett McCabe has said 'good focus is when you focus on one thing and nothing else matters.' Elk has done that by saying 'I don't want to go anywhere else' then he aims and fires at the target. This beats the golfer that is overly worried about the water, aims well right of the green bush and tries to hit a draw. The focus is still divided in that situation and usually what happens is the golfer will miss well right. Elkington sees where he wants to hit the ball and gives himself a good chance to hit a great tee shot. On the 18th hole he knows his distances, about 290 yards to run out of fairway by aiming at those 3 pine trees. He then says 'I don't really need to know much more than that on this hole.' Elk then points to other various parts of the yardage book on the hole...but goes back to all he really needs to concern himself is with the line to the 3 pine trees because that's where he wants to be. Elkington is one of the best drivers of the ball in the past 30 years on Tour. And while mechanics and strategy are helpful to great driving, you still need a healthy psychological attitude and focus to drive the ball great and that's what Elk has. Whenever I’m learning something new in golf and trying to improve, I find that it works best if I can determine why I was successful in the past and why I was unsuccessful in the past. First, I wanted to get into basics of putting. Not only working on some basic principles of the stroke (particularly focusing on the launch direction), but getting a very ‘basic’ looking putter. I was looking for an Anser style head, with a head weight of 350-360 grams, with a standard offset plumber’s neck along with an alignment line in the flange and a something that was 35 inches long. I also wanted something in a black head. With that, I purchased a TaylorMade Ghost Daytona Black Tour putter. The TM Ghost Daytona Black Tour putter is spec’d at 355 grams of putter head weight, but the putter head actually measured in at 357 grams (usually there is a +/- 2 gram tolerance for head weight for OEM’s). I had the lie angle at 71* with the putter being 35” long. However, looks isn’t the only thing that matters for me, I’m also interested in feel. And that is not only about contact feel, but the heft of the putter and the grip. I was a big fan of the old Wilson 8802 putter I had (once again, it was stolen out of my bag one day and I could never find another replacement that felt like it). What I knew about the 8802 was that it had a head weight of around 335 grams. 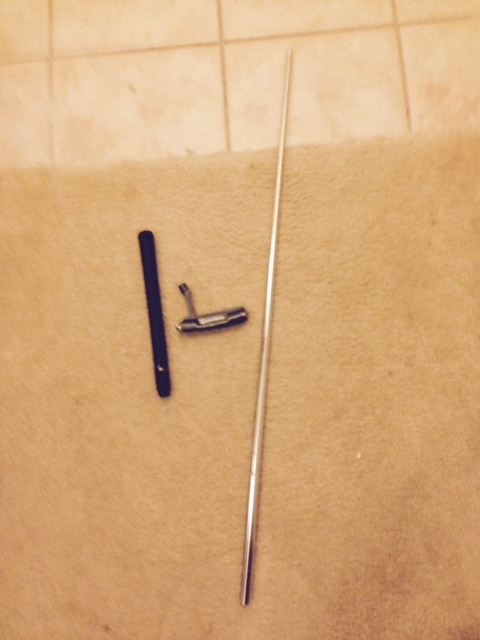 The shaft, raw and un-cut was about 125 grams and the leather Neumann grip was about 60 grams. A lot of companies are going to a counterbalancing method and it has worked wonders for some golfers. My issue is that there is too much of the weight being put on the grip end instead of being more evenly distribute thru the shaft. 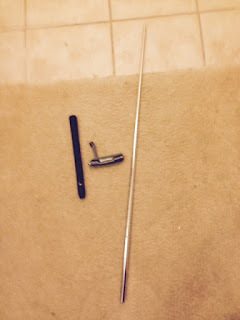 So I was more interested in seeing how a heavier shaft would play out instead of counterbalancing the putter. With that, I decided to take a look at the Nippon putter shaft. They have 2 models, a 136 gram and 149 gram model. I chose the 136 gram because along with the GripMaster USA leather grip (weighs 62 grams), it would get the balance of the shaft+grip versus putter head weight to 55%. 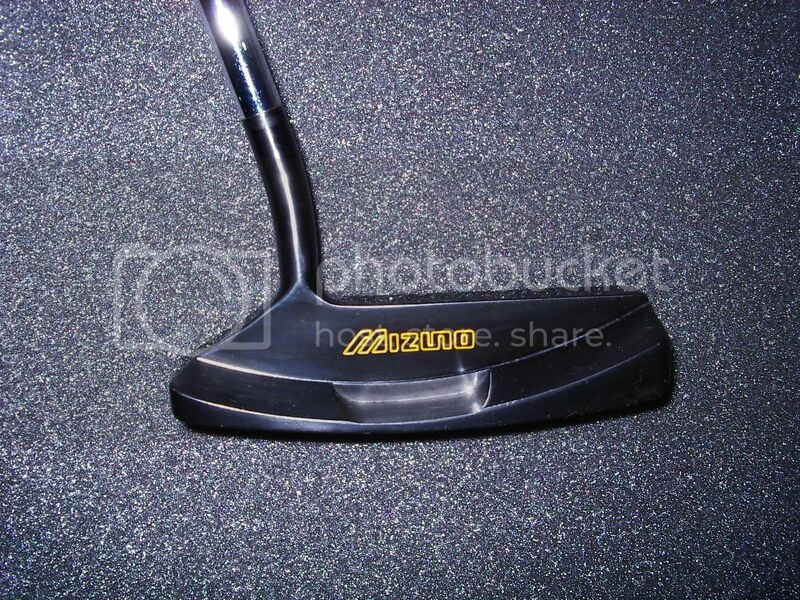 I also decided to purchase the old Ping B61 putter off of eBay. I wanted to remove the head so I could see what the components weighed. Only one problem…the old Ping putters had a ball bearing at the tip of the shaft to keep the shaft in place and I couldn’t remove it. I sent it to the PGA Tour Superstore where they informed me about the ball bearing in place and they couldn’t remove the head either. I was told to send it to Ping if I want the head removed. However, it was launching the ball in the best direction. The TaylorMade Ghost putter had a nicer feel and I really like the feel of the leather grip. 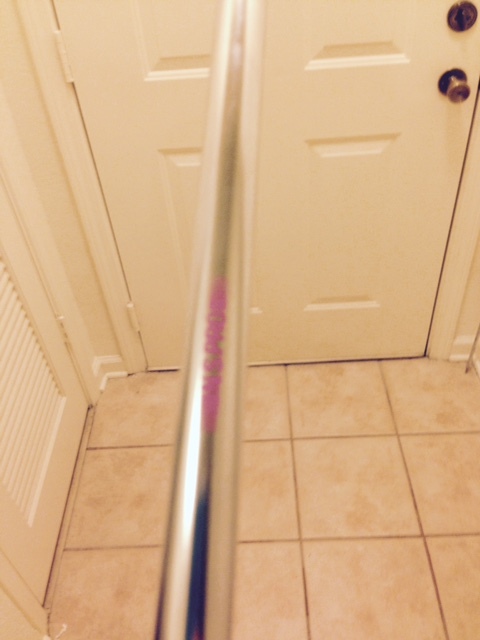 This led me to conclude that I like a firmer feeling putter grip with some tack to it. Makes sense as I could never get into those spongier grips like Winn or SuperStroke. And I liked the feel of the Nippon putter shaft. But, I think in the end between how light the Ping B61 putter felt, the Wilson 8802 being only 335 grams in head weight and the hosels of the 8802 and B61 being more towards the heel…I started to see that I performed better with lighter putter heads and the hosel more towards the heel. 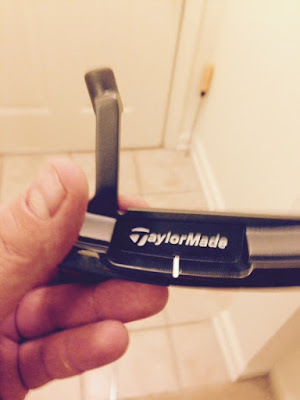 I still continued to work with the TaylorMade Ghost putter. And I still had some issues with using that putter and using the Putting Tutor aid. Mainly, I would tend to close the putter face and/or yank the putter head inward right at impact instead of moving the putter head right down the line. I did notice that my eyes were not over the ball with the putter. I had discussed some of this with golf instructor and friend, Justin Blazer (http://www.durangolf.com/development-center-academy/instructors/justin-blazer/) and how that affects aiming. I’m not a big fan of making it mandatory to have the eyes over the ball putting. I tend to concur with Geoff Mangum on the eyeballs should be pointing in the same direction as the person’s face. But, I started to conclude that for me and my putting stroke, I was better off having the eyes over the ball. Thankfully, the Putting Tutor has lines that help you figure out if you’re too close or too far away from the ball. Scott was a former mini-tour player who has qualified for the US Open. He works with many golfers such as Will Zalatoris and US Amateur Champion Bryson DeChambeau. I talked with Scott at the 2015 PGA Merchandise Show and was very impressed with his DECADE Scoring System as the general philosophy matches what I've seen analyzing holes on Tour. Scott's system can go much more into detail for particular courses than I can and he also appears to have some interesting work being done in mastering the pre-shot routine. I like his phrase about golf being a game where you are shooting a shotgun, not a sniper rifle. Unfortunately, most golfers...even PGA Tour players...take the sniper's approach despite having a shotgun in their hand. If they are not certain they can hit a specific target, often times because the rest of the field is avoiding trying to hit that shot, they will avoid hitting that shot as well. But, in the end that costs them valuable strokes if in all likelihood they would hit their 'shotgun' into good position. Recently, I conducted some research that I will be putting in 2015 Pro Golf Synopsis (should be out in December 2015) and what I've found is that this is a game where golfers are predisposed to loss aversion and have to overcome it to create a gain bias. It's the old "playing to win" versus "playing not to lose." And I think Scott's DECADE Scoring System gives the golfer the tools to understand how to play to win. 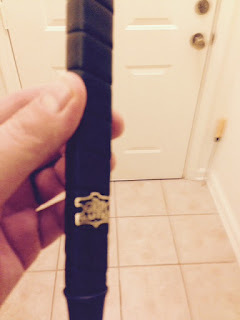 In part III, I wanted to discuss the actual flatstick because this is what The Search for Flatstick Nirvana is about…finding Billy Baroo. After starting out with your typical beginner blade style putter, I then purchased the old Ping Anser model. It’s funny how times change with putters. When the Anser first came into popularity, there were a lot of golfers that eschewed the looks of the Anser design as being ‘ugly.’ Now, every putter manufacturer has their own Anser model. That’s probably where Karsten Solheim’s brilliance has gone most underappreciated, he essentially came up with the majority of today’s putter designs. 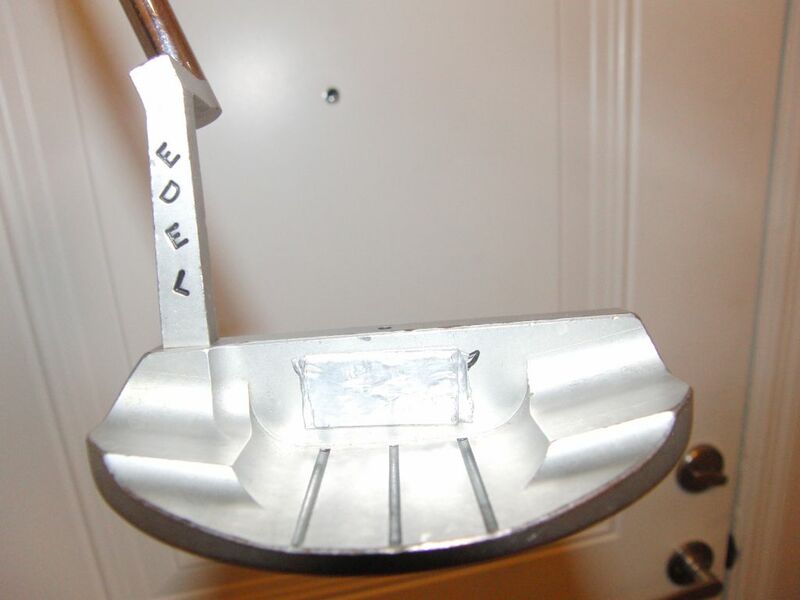 Outside of the mallet style/high MOI putters, there has been very little in the way of new putter designs from what Solheim created decades ago. I decided to purchase an Anser style design for now. I wanted something ‘neutral’ in terms of alignment and fitting a putting stroke pattern. So, I wanted 1 alignment line in the flange with a plumber’s neck. I wanted a fairly ‘neutral’ weight (not too light, not too heavy) and was looking for something in the 350-355 gram head weight range. I also wanted something that was 35” long. In the end, I settled on the TaylorMade Ghost Daytona Tour Black putter. I putted best with the Wilson 8802, the Ping B61 and the Tad Moore custom putter (a friend of mine had it for a week and sold it to me. It was a custom design with a hosel that looked more like Ping B61 hosel. The plan I usually have is to figure out why I performed well at a certain time in the past and why I performed poorly at a certain time in the past. 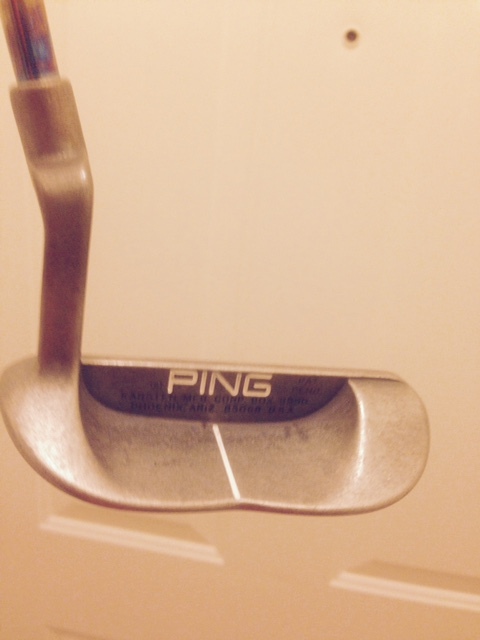 So, I hope to find out why I putted better with the Ping B61, the Tad Moore and Wilson 8802. Finding my very own Billy Baroo doesn’t make much sense without improving my putting stroke. One can have the greatest tool in the world, but if they don’t know how to use it then they are just spinning their wheels. Part of the genesis for The Search for Flatstick Nirvana is that I’ve made tremendous strides in my swing working with Kelvin Miyahira. I have also learned movement pattern training methods from instructor Lucas Wald and some other things from people like Mike Hebron, Trilliium Sellers Rose, Dr. Keith McDaniel and others that I feel that I can practice more efficiently. In other words, I can spend less time practicing the full swing and get better at sustaining my mechanics and implementing new mechanics. It’s no longer the ‘chiropractor approach’ to practice where I must spend time on the range in fear of my swing getting out of whack. For instance, I was striking the ball extremely well for about 3 months straight once I figured out a movement pattern training regimen that worked for me. But, in the last 2 weeks I started to get into a funk with my golf swing. With that being said, my scores on average were still very good, I just wasn’t hitting the ball quite like I was in the 3 months prior. I finally got some movement pattern training in front of a full length mirror and found out a couple of things that were giving me issues (one of which I’ve never really practiced) and voila…back to hitting the ball like I was in the previous 3 months. That has made me confident that I don’t need to practice as much with the ballstriking because my swing mechanics changes have become permanent and I have the practice regimen in place to troubleshoot problems and implement new mechanics if needed in a short period of time. With the success I’ve had with movement pattern training with the full swing, I plan on giving it an attempt with the putter as well. The difficult part is that the putting stroke is much shorter than the golf swing. Furthermore, we want to let “gravity do the work” on the thru stroke instead of accelerating the putter thru the ball. With slow motion training, it may be very difficult to alter speeds of the putting stroke to progress. Furthermore, with slow motion training it may be counterintuitive to “letting gravity do the work” in the thru stroke. For me, the largest issue I’ve had with my putting is with the aim. I have a tendency to aim severely to the right of the target. My way was to work on aiming the putter correctly and then that would take care of the rest. But as John Graham (www.johngrahamgolf.com) recently tweeted, from his experience if you want to improve your aim you need to improve your stroke, first. Then the golfer starts to figure out the aim. By trying to fix your aim first, the golfer is likely to make compensations in their stroke to counter their faulty aim and more or less fall into the same old habits. Putting instructor and neurology expert, Geoff Mangum (www.puttingzone.com) , discusses that as well. What I found before I saw the Mangum video is that I would consistently hit the left marble, even though I was taking my putting stroke on an inside arc and NOT looping it either. I found that I had a tendency to ever so slightly yank the putter head in too soon and that would cause the ball to launch left. Perhaps explaining why I aimed right….to naturally counter that leftward launch. I found that it almost felt like I was trying to hit a ‘push-draw’ with the putter in order to get the ball thru the marbles. I also found that when I was getting the putter head going down the line just after impact, the follow thru was shorter and it felt like I was just naturally allowing gravity to do the work in the thru stroke. One of the things I had heard Frank Nobilo (and I believe Brandel Chamblee as well) discuss is how when they see guys on Tour putting well they don’t ‘recoil’ putter head in the follow thru. And I think that is a case of a golfer letting gravity do the work and not yanking the putter head inside right into impact. Or letting the ‘boom’ do the work as Geoff Mangum illustrates. What I did find is that my launch improved, but I had a difficult time with speed because the ball was traveling further despite putting what I felt was the same amount of effort. With that, I purchased the Mi Putting Template. If it didn’t require any practice, then everybody would reach flatstick nirvana. But now armed with better knowledge on how to practice and to obtain new movement patterns and make them permanent, the journey seems perfectly attainable.